In my English class last semester, we had to choose a movie playing at International Cinema and write a review about it. So here it is. The premise of Ocean Heaven looks like a very promising tear-jerker: A father with a terminal illness, awaiting his own death, must find a way for his autistic son to survive on his own. And it stars Jet Li as the father. However, while someone would expect a powerful film, Ocean Heaven does not really pack a punch. Don’t get me wrong, Ocean Heaven is a decent film, just not as moving as I anticipated. The film is about Wang (played by Jet Li) who works at an aquarium. 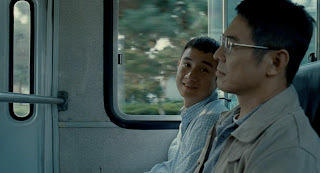 Wang is a widower who takes care of his twenty-two year old autistic son, Dafu (portrayed by Zhang Wen). After finding out that he is suffering from a terminal illness, Wang must find a place where Dafu will be taken care of after he dies. It seems like compelling stuff, but the whole movie is subtle and does not really invoke any strong emotions. And I think that is partly because of the script and partly due to the restrained acting. There are some tender moments between the father and his son. There are also some hard moments. But these are all small; there are no big, emotional scenes that most drama movies of this kind normally have. There are no dramatic hospital scenes, no powerful “I love you” moments. The emotions are pretty much low-key here. I could see and understand why this situation would be hard on Wang; but, I never felt his struggles. The script could have also benefited from some more revisions. There are a few plot points and scenes that feel a little out of place. The opening scene sets you up for one type of movie, but fails to follow that, taking you in a totally different direction. The beginning brings up some interesting ideas and questions, but the rest of the film never pursues or examines them. It is almost as if it never happened. And just like how there is no follow up to the opening scene, there is no build up to the ending. I do not want to give anything away (though, the movie is fairly predictable with no real surprises) but the ending involves a sea turtle. But I do not think we ever see a sea turtle before then. Sea turtles actually play a pretty big part in the ending of the film, but it comes as kind of a shock because it appears so random. The guy works at an aquarium; I imagine it would have been fairly easy to insert a scene early in the movie, introducing the idea of the sea turtle. But, there is none; so the ending is a little weird and not as compelling as it could have been. The same thing applies to the mother. Early in the film, it is established that she died when Dafu was still a young boy; but, it leaves it at that. Later in the movie, some more information is revealed about the mother’s death. But, because she is basically absent from the whole movie (there may have been one flashback), this revelation has little impact. But, like I have said, Ocean Heaven is worth watching. The actors do a good job. This is Jet Li’s first main role outside of the action genre. He trades in his lightning fast hands for a pair of glasses and a blue jumpsuit. Li plays an average man who works hard and wants the best for his son; and he pulls it off pretty well. Zhang Wen also is believable in his role of Li’s autistic son. I have not spent any time with autistic children, so I do not know how “realistic” his portrayal was; but I bought it. (Though, the hand thing seemed a little weird to me.) All of the supporting actors are also convincing in their roles. It does bring up some interesting points about our society. Whose responsibility is it to watch after and take care of a person with a mental disability when he has no family members? Dafu is twenty-two years old with no mother and a dying father; and all of the institutions that Wang visits are unable to accept Dafu. Wang tries to teach him how to take care of himself; but without external support, it does not appear to be enough. Should the government institutionalize him? Should the community get involved? Who should be responsible? It is interesting to see what points and themes are brought up, considering that the writer and director, Xiao Lu Xue, had previously volunteered for fourteen years at an organization for autistic children. Ocean Heaven is her directorial debut. Her only previous film credit was writer of Together (2002), which was also about the relationship between a father and his son. 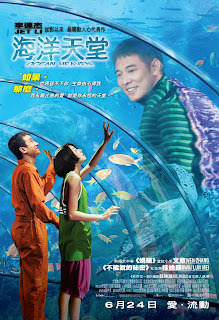 While not as moving as expected, Ocean Heaven is good film. It has a strong story with honest acting; but, everything was too subtle to really stir me. But, it is worth watching. I give it three out of five.